Fairfield’s Kaiti White throws a pitch on Tuesday at Fairfield High School where the Lady Lions hosted SHAC rivals the Peebles Lady Indians. White and the Lady Lions used a big sixth inning to pull away for a 5-0 win. LEESBURG — The Fairfield Lady Lions varsity Softball team hosted the Lady Indians from Peebles on Tuesday at Fairfield High School in a Southern Hills Athletic Conference rivalry game that ended with Fairfield registering a huge 5-0 win over the biggest threat to it’s SHAC dominance. Kaiti White got the start in the circle and pitched seven innings on one hit Softball in the circle for the Lady Lions while striking out 13 batters to pick up the win. The lone hit in the game for Peebles came in the top of the second inning when the cleanup hitter for the Lady Indians smacked a triple down the left field line. The Lady Lions took a 1-0 lead early in the game when Megan Gragg recorded a double in the second at bat of the game for the Lady Lions and Kaiti White followed up with a single and Layla Hattan also had a single in the inning. Gragg scored during the stretch to give Fairfield a lead it would not relinquish. Madison Pierce was very good in the circle for the Lady Indians as she struck out seven batters and held Fairfield in check in the second, third, fourth and fifth innings while allowing two hits and no runs. The Lady Lions found their groove in the bottom of the sixth inning when Fairfield sent eight batters to the plate and scored four insurance runs to provide the final 5-0 margin of victory. Gragg singled, White doubled and Hattan singled to start the inning and Gragg scored on Hattan’s single to score the first run in the game since the first inning. Taylor Lawson managed to get a ball past the first baseman to score White from third base and Haleigh Lowe had a single of her own in the next at bat to plate Hattan for a 4-0 lead. Caitlin Cambell, who entered the game as a courtesy runner for Lawson, scored from third base on a sacrifice bunt by Molly Thackston that provided the final run of the game for either team. 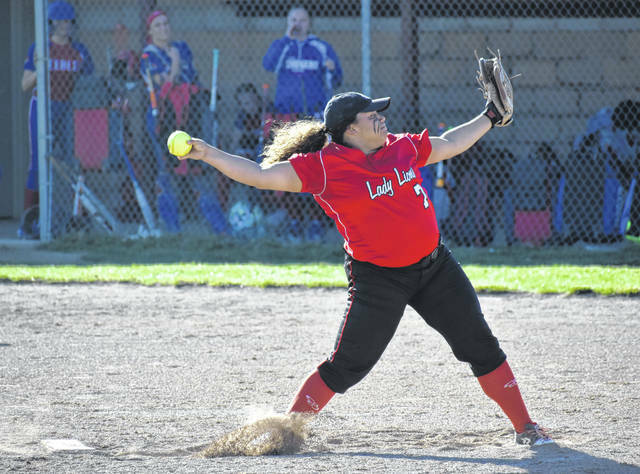 The Fairfield Lady Lions returned to Southern Hills Athletic Conference play Monday and shut out the Ripley Lady Blue Jays (2-5, 1-4 SHAC) 15-0 in a game played at the Fairfield Baseball and Softball Complex. The game was scheduled to be play at Ripley Middle School, but the softball field was too wet. The venue was changed to Fairfield, but Ripley remained the home team on the scoreboard. Kaiti White, Megan Gragg, and Harley Flint combined for the three hit shutout. Kaiti White gave up one hit and struckout 9 Blue Jay hitters in three innings of work. Lyndee Spargur, Kaiti White, Lauren Arnold, and Molly Thackston led the 18 hit attack with 3 hits each. The Fairfield Lady Lions scored 4 runs in the top of the first inning, 3 in the top of the second inning, 4 in the top of the third inning, and 4 in the top of the fourth inning. Amassing 15 runs on 18 hits. Leading hitters for Fairfield: Lyndee Spargur (3 for 4, 3 runs, 1 rbi), Megan Gragg (1 for 3, 3 runs, 1 rbi), Kaiti White (3 for 4, 3 runs, 4 rbi), Layla Hattan (1 for 3, sac fly, 2 rbi), Lauren Arnold (3 for 4, 2 doubles, 2 runs, 3 rbi), Taylor Lawson (1 for 3, 1 rbi), Hayleigh Lowe (1 for 2, 2 rbi), Caitlin Campbell (1 for 2, 1 run), Molly Thackston (3 for 3, 2 doubles, 2 runs), Halle Hamilton (1 for 3, 1 run, 2 rbi). Kaiti White (10-0) was the winning pitcher for Fairfield. Kaiti’s Pitching line: 3 innings, 1 hits, no runs, no earned runs, no walks, and 9 strikeouts. Megan Gragg’s pitching line: 1 inning, 1 hit, no runs, no earned runs, no walks, and no strikeouts. Harley Flint’s pitching line: 1 inning, 1 hit, no runs, no earned runs, no walks, and no strikeouts. Olivia Dragoo suffered the loss for Ripley. Dragoo’s pitching line: 5 innings, 18 hits, 15 runs, 9 earned runs, no walks, 1 strikeout. Tom Purtell, the Assistant Coach of the Lady Lions, contributed to this story.